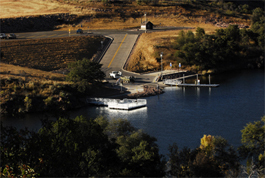 The Boating Facilities Section in the Development Branch administers three grant programs to assist with boating in Arizona: Boating Access, Boating Infrastructure, and Clean Vessel Act. Congress allocates annual funds to the U.S. Fish and Wildlife Service to support these programs that are largely restricted to on-the-ground activities, and enhance boating access and facilities for the recreational boater and fisherman on Arizona waterways. The entire area remains open daily for walk-in access. Additional improvements to the Agua Fria boat ramp and associated facilities are anticipated to continue over the next several months. The access road just after Rock Crossing campground will close Sept 6, for the remainder of the year to facilitate further renovation of the boat ramp. There will be no vehicular access to the lake during this period. If you have any questions, please contact Ron Christofferson, Boating Facilities Program Manager, at (623) 236-7481.